A lunotriquetral tear is a tear of a ligament in the wrist, on the opposite side of the more common scapholunate tear. 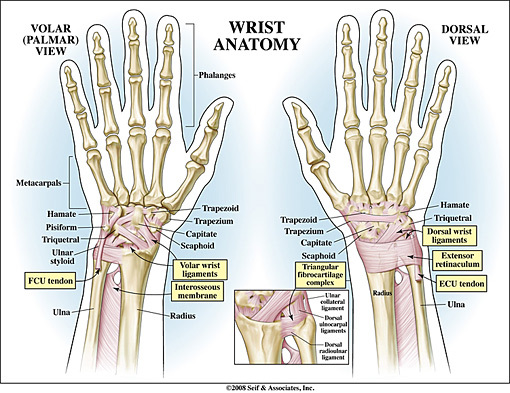 The eight bones that comprise the wrist are held together by tough bands of ligaments that connect the wrist bones to each other, and to the forearm bones and finger bones. The lunotriquetral ligament is centrally located at the region of the ulna (the smaller forearm bone) and carpal (wrist) bones. A lunotriquetral tear is in the region of the triangular fibrocartilage complex and is often difficult to differentiate in wrist pain. An MRI image can assist in the clinical examination, and in differentiating the various diagnosis in chronic wrist pain. Conservative treatments for a lunotriquetral tear include immobilizing the injured segment and, obviously, refraining from athletic endeavors during the healing period. There are a variety of conservative measures in the mild or early cases that are effective without surgical intervention, including therapeutic modalities. Platelet-rich plasma (PRP) has also shown a role in the conservative measures of healing a lunotriquetral tear and even in other ligament injuries. Platelet-Rich Plasma (PRP) therapy captures the healing growth factors that are in a person’s own blood. By injecting the PRP into the damaged area of the wrist, it may help heal the affected area and diminish pain. In addition, there are indications for platelet-rich plasma in healing a variety of conditions, in much the same way that stem cell therapy may help regenerate different types of tissues. If you suffer with a lunotriquetral tear and your current treatment plan leaves you feeling hopeless, perhaps a fresh set of experienced eyes can change your outlook. Since 1990, Dennis M. Lox, M.D has applied his personal interests in sports medicine, cutting-edge regenerative medicine and chronic pain management to helping patients increase their quality of life. Contact us for an appointment at 727-462-5582.